Silk flowers are now replicated with precise botanical detail and are stunningly realistic. They are low maintenance and brighten low-lit areas of offices or homes. 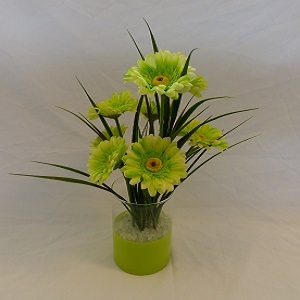 They are perfect for hospitals, where real flowers can carry a risk of infection and cause allergies. Interior designers, to complement a colour scheme or enhance the design element of a room, often use silk flowers. Silk flowers also make excellent table settings for weddings and special celebrations. The perfect gift, they offer the beauty of seasonal flowers, such as spring daffodils, summer roses and splashes of festive red at Christmas. 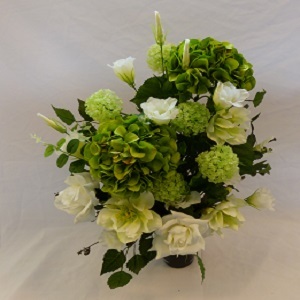 Time for flowers stocks silk flowers at very competitive prices, which compare favourably to online retailers, but with the added personal touch. They can be supplied with or without a vase. Whether you want simplicity, elegance or a bold splash of colour, our professional team of florists will fulfill your personal requirements. In addition to supplying a wide range of beautiful flowers and plants, Time for flowers can add a gift to your bouquet or arrangement to make it unique. Sue carefully selects tasteful gifts from local businesses, to complement your bouquet or floral arrangement. These mementos include photo frames, vases, candleholders and other small gifts, which provide a delightful touch and can be enjoyed for a long time.